Mid Penn Bank’s mobile app provides access to your banking wherever you go! Simply download the app on your smartphone and log in the same as you do with online banking. 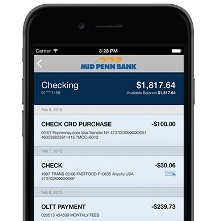 Mid Penn Bank’s mobile app is a secure product intended to make banking more convenient for you! Download the Mid Penn Bank app on your smartphone through the Apple® App Store or through Google Play™ for Android®. Test our mobile app today! Our demo will show you how easy it is to deposit a check, make a transfer and pay bills online through our mobile app. Bank your way with mobile deposit! With our mobile deposit service, you can deposit your checks safely and securely through our mobile app. If you do not currently have the Mid Penn Bank app downloaded, you can download it on your smartphone through the Apple® App Store or through Google Play™ for Android®. You can deposit as many checks as you’d like in one day, up to a $1,500 total limit.